And this, dear Readers, is the other Andy, to whom I alluded, many many moons ago in the (as yet still unwritten) Old Guard section at the top of the screen. In ‘To begin at the beginning’, I took a look at where the love of dogs originates in our household, and it was with what we Dickens Dogs call Andy Number One, as recalled in that piece. But here is the next chapter in the story and though outwardly similar – a terrier of the same breed – the two boys couldn’t have been more different. 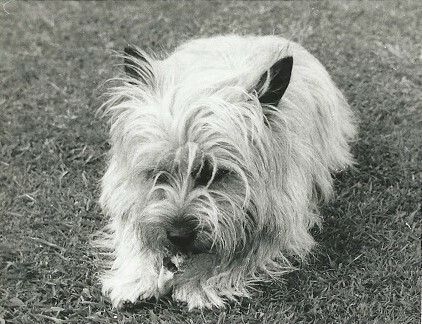 In this picture we find Andy Number Two, when he was about two years old, chewing thoughtfully on a real bone (those were the days), in a garden we all knew and loved from the boys’ recollections and Uncle Jonny’s stories about all those who went before us who frolicked there over the decades. I can imagine it all as it was: pink floribunda roses cascading over the pergola, interspersed with giant loganberries which simply kept on coming throughout the summer. Behind them, the summerhouse, perhaps the awning erected to extend the shade further on a glorious afternoon. In the distance, a lawnmower and overhead, as always and as now, the conversation of the gulls. 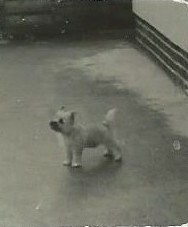 Although there are several pictures of this dear little fellow when he was a boy, none is better than this grainy one – taken when he was little more than eight weeks old – when it comes to suggesting what an absolutely magical pup he was: a perfectly formed but tiny Cairn, right from the word go. He was brought from near the beautiful ancient town of Dartmouth in South Devon to fill the void which the death of Andy Number One had left. From the moment he was lifted up, he clung lovingly on, as sweet-natured, gentle and companionable as his predecessor had been feisty, independent-minded and stubborn. The Andy pup slept on Kemo Sabe’s bed that first night (those obviously were the days) , his tiny form fitting perfectly at the foot of the bed where he was discovered sleeping soundly after she woke up next morning. He was small and patient enough to be carried in a wicker shopping basket on walks to the sweetshop or bakers, which introduced him to the world well before he could be put on the ground and meet it face to face; so right from the start he became the best kind of wordless companion: one that everyone admires and reaches for emotionally. When times were tough, he hung in there, offering unmeasured affection and loyalty, as well as a swift pair of heels for walks of inordinate length, whether across heath, down or beach. When Uncle Newman Noggs came along, Andy gently picked up the puppy’s lead and walked along with him round the garden teaching him many wonderful and useful things: though getting on in years himself, he liked the novelty of a new friend and they spent many happy hours together, discovering new places to visit and eat their dinners. The presence of a beloved dog lingers on and when, in the fullness of time, he was laid to rest alongside his Cairn terrier namesake across the lawn from Kemo Sabe’s old bedroom, he lived in everyone’s hearts and in their recollections, which were many and various: the late-night walk to see the hedgehog on his ramblings up the road, the beautiful expression on his loving face, the sunny personality – never a moment of harshness in his whole life. He was a saint among dogs, and there are few of whom that can be said. The cross Ten Blankets made for his grave is now upstairs, removed from the site when the house was sold last year. His pictures are around the house. And Andy lives in our hearts.